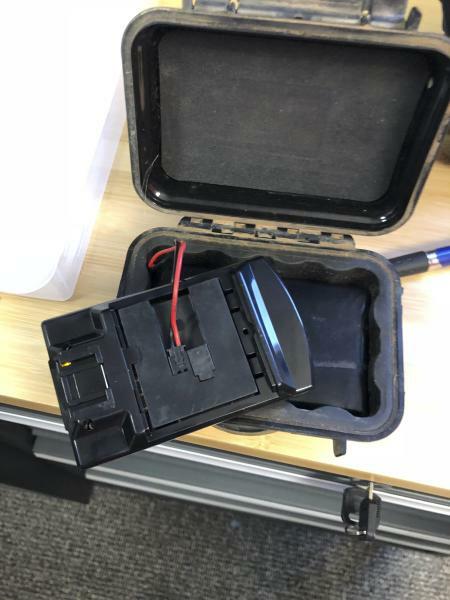 OKLAHOMA CITY (AP) — An Oklahoma lawmaker who found a tracking device attached to his pickup truck last month is suing a private investigation company and an investigator who works for the company over the device. Discovery of the tracking device has shocked Oklahoma politicians, who are wondering who was spying. Rep. Mark McBride, a Republican from the Oklahoma City suburb of Moore, is suing Eastridge Investigations and Asset Protection and Eastridge investigator H.L. Christensen for unspecified damages of more than $10,000, according to an attorney for Eastridge. The lawsuit, first reported by The Oklahoman, is an amended version of a lawsuit McBride filed in December naming "John Doe" and alleging trespassing, invasion of privacy, intentional infliction of emotional distress and negligence. On Jan.3, a judge approved a request to issue a subpoena to the company that manufactured or serviced the device in an effort to determine who purchased it. "My attorney filed the lawsuit and from that lawsuit, we identified (the company and investigator)," as a result of the subpoena, McBride told The Associated Press on Saturday. Danny Shadid, an attorney for both Eastridge Investigations and Christensen confirmed the lawsuit, but declined on Saturday to discuss the allegations. "I just don't like to comment on matters pending before the court," Shadid told the AP. A telephone message left at Eastridge Investigations was not immediately returned. The Oklahoman reports the company is operated by former Oklahoma City police homicide detective Kyle Easterling and his wife. Kyle Easterling retired from the police force in 2010 to work for the Oklahoma State Bureau of Investigation's cold case unit, only to leave OSBI after six months, complaining to reporters of "incompetence, laziness and fraud" and internal strife within the agency. He continues as a private investigator to investigate suspicious deaths. McBride reported finding the tracking device underneath his truck on Dec. 4 and has said he suspects wind industry officials are tracking him because of his efforts to raise taxes on wind farm operators. Oklahoma Wind Coalition Executive Mark Yates has denied that wind industry representatives are spying on McBride. McBride, who has been a strong supporter of the oil and gas industry and a vocal critic of subsidies Oklahoma pays to wind companies, also declined comment on whether he still believes wind industry representatives or other parties were behind efforts to monitor his movements. "I just hope we get to the bottom of this," he said. Both the Oklahoma State Bureau of Investigation and Oklahoma County District Attorney David Prater are investigating the case. "This is outrageous behavior and very reckless and foolish, and it could lead to somebody getting hurt," Prater said Wednesday, adding that the tactics could lead to felony stalking charges. "They (Oklahoma State Bureau of Investigation) are investigating it, and I'm going to be very aggressive in the prosecution of these matters if in fact they have the evidence to prove the case." Associated Press reporter Sean Murphy in Oklahoma City contributed to this report.